Rebecca Johnston and Tessa Bonhomme, members Canada’s national women’s hockey team, 2010 Olympics. Johnston is competing in South Korea. Residents Invited to Sign Banner for Local Olympians Greater Sudbury residents are invited residents to sign a banner supporting local athletes competing in the 2018 Olympic Winter Games in PyeongChang, South Korea. Local athletes include: • Meagan Duhamel, from Lively, Figure Skating; • Rebecca Johnston, from Sudbury, Ice Hockey; • Devon Kershaw, from Sudbury, Cross-Country Skiing; • Chris Del Bosco, from Sudbury, Freestyle Skiing. “I am extremely proud of our local Olympians and I’m excited to cheer them on as they represent Canada and Greater Sudbury on the Olympic stage at the 2018 Olympic Winter Games,” said Greater Sudbury Mayor Brian Bigger. “As a community, let’s come together to showcase our hometown support for our local Olympians as they compete against the very best at the Olympic Games.” The banner will be available for signing from February 9 to 11 at the following locations: • February 9 at Tom Davies Square in the foyer from 9:30 a.m. to 3 p.m. • February 9 at the Sudbury Arena during the Sudbury Wolves game from 6 to 9:30 p.m. • February 10 at Gerry McCrory Countryside arena from noon to 4 p.m. • February 11 at T.M. Davies Community Centre and Arena from 9 a.m. to 3 p.m. The banner will then travel to the Olympians in PyeongChang on behalf of the City of Greater Sudbury. Meagan Duhamel, born in Lively, and Pairs partner Eric Radford won two medals at PyeongChang 2018, helping Canada win gold in the team event followed by a bronze medal in the pairs event. Duhamel and Radford won back-to-back world titles in 2015 and 2016, making them the first Canadian pair to successfully defend their world gold medal since Barbara Wagner and Robert Paul won four straight from 1957 to 1960. Their first world title capped an undefeated season that included wins at both of their Grand Prix events, the Grand Prix Final and the Four Continents Championships. 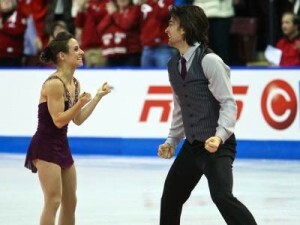 Duhamel and Radford had previously won bronze medals at the 2013 and 2014 World Championships, the latter coming after they had helped Canada win silver in the inaugural Olympic team event in Sochi. Tessa Bonhomme is a hockey player and television sports reporter. She was an Olympic gold medalist as a member of the Canadian national women’s hockey team. The defenceman was also co-captain of the Ohio State Buckeyes women’s ice hockey team in the NCAA. The 29-year-old is the fifth-highest scoring blue-liner in Team Canada history with 51 points on 10 goals and 47 assists in 107 games. She retired from hockey in 2014 and joined TSN as a host and reporter for SportsCentre as well as a contributor to TSN’s coverage of Hockey Canada events. Alex Baumann was selected as Canada’s flagbearer for the opening ceremonies. He won gold medals in the 400-metre individual medley, setting a world record time of 4:17.41, and the 200-metre race, lowering the world mark to 2:01.42. The 400-metre gold was Canada’s first in swimming since 1912. In September 2006, Baumann was hired to take over Canada’s Road to Excellence initiative for the 2008 and 2012 Summer Olympics. Gord Appoloni was the Canadian Olympic Team boxing coach in Atlanta (1996). Boatmen John Beedell and Joe Derochie competed in the single-blade tandem event in Rome (1960). 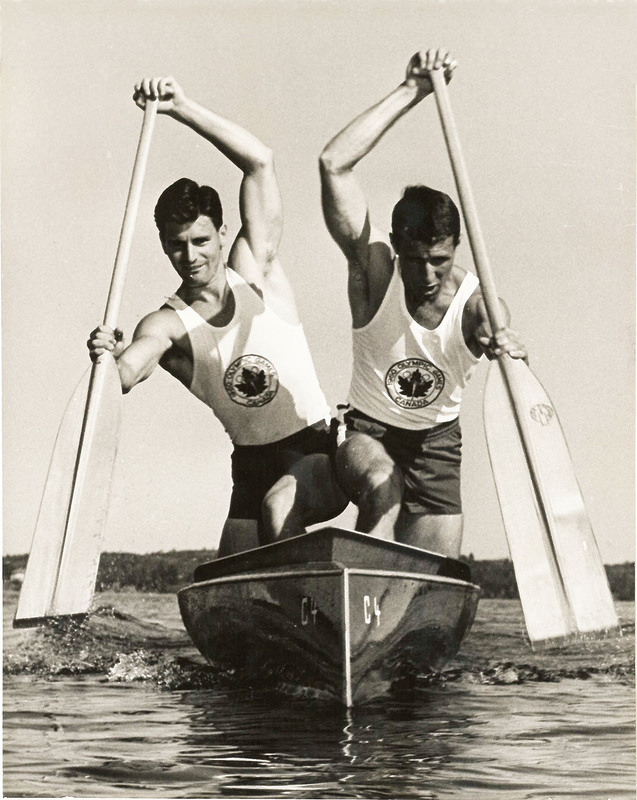 John Beedell and Joseph Derochie, a team from the Sudbury Canoe Club, competed in the tandem/C-2 event at the 1960 Rome Olympics. Despite a strong effort at the Rome Olympics, the pair did not make the podium. Beedell was introduced to competitive canoeing in his off-hours while working a summer job with the International Nickel Company in Sudbury. His paddling partner, Derochie, was introduced to the sport by his brother who was also competing at the canoe club on Sudbury’s Ramsay Lake. In 1957, Beedell and Derochie were named National Champions in C-2 and became the first Canadians to compete at a World Canoe Championship, held that year in Czechoslovakia. Todd Bertuzzi got three assists in six hockey games for Team Canada in Turin, Italy (2006). Boxer Phil Boudreault competed in Atlanta (1996). Figure skater Jeff Buttle won a bronze medal in Torino in 2006. Competing in Innisbruck, Austria, in 1976, ice dancer Sue Carscallen and her partner Eric Gillies of North Bay finished 11th overall. Peter Ennis, the former Laurentian University women’s basketball coach, coached the 1996 national women’s team in Atlanta. Robert Esmie won a gold medal in the 4×100 m relay at the 1996 Summer Olympics in Atlanta. Omer Gagnon was a boxing official and judges in Montreal (1976) and Atlanta(1996). Speed skater Alex Hurd competed in 1932 at Lake Placid and won silver in the 500-metres. He was named captain of the 1936 Canadian team, but the team didn’t attend Winter Games in Garmisch-Partenkirchen, Germany, due to finances. Wrestler Matti Jutila competed at the Tokyo Summer Olympics in 1964 (freestyle and Greco-Roman groupings). Cross-country skier Devon Kershaw, born in Sudbury in 1982, competed in Torino in 2004. Louis Lukanovich, along with partner Al MacLean of Cartierville, competed in the kayak tandem event in Rome (1960). John MacKibbon played basketball for Canada in Rome (1960) and Tokyo (1964). Gino Roy Pella competed at the 1952 Olympic Games in Helsinki. The Sudbury native finished 14th in the discus event. Eli Pasquale played basketball for Canada in Los Angeles (1984) and Seoul (1988). Leo Roininen competed in shot put in London in 1948. Weightlifter Aldo Robert Joseph Roy, born in Sudbury in 1942, participated in Mexico City in 1968 and finished 15th overall. He was CBC Sports’ weightlifting analyst in Athens in 2004. Joe Derochie competed in Canoeing in the 1960 Summer Olympics. Kevin Roy, born in Sudbury in 1963, competed in the weightlifting event at the 1984 Olympic games in Los Angeles. Jeno Tihanyi coached the Canadian swim team in Los Angeles in 1984. Dave Turcotte played basketball for Canada at the Summer Olympics in Seoul in 1988. Rob Schinke went to the 1996 Atlanta Olympics as part of the Canadian administration contingent. He served as a sports psychologist. Former Laurentian University professor and writer Ron Wallingford went to the 1976 Olympics in Montreal as the director of the marathon. Cyclist Eric Wohlberg competed in Athens in 2004. James Zavitz finished 13th in the free pistol-shooting event and 25th in the rapid-fire pistol event at the 1956 Games in Melbourne, Australia.